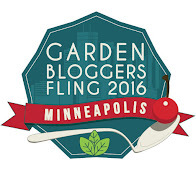 Garden blogging has been such a great pastime for me since .....December 7th, 2008! Time sure flies. Thought I would get my post done for this yesterday...but I had no idea what the 'date' was...or rather hadn't paid too much attention to it. Oops. So happy belated Blogiversary to me! Five years have gone by quickly. 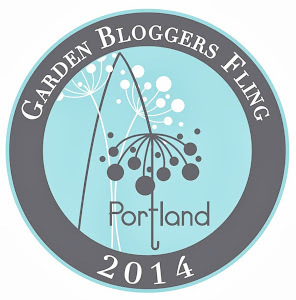 I have been enjoying being a part of the garden blogging community. Some of the garden blogging community got together this past Friday to celebrate South Carolina's Arbor Day. This was the third year I have gone to USC Upstate to listen to the speaker, the first time was Dr. Michael Dirr, second year Traci DiSaboto-Aust, and this year was Dr. Alan Armitage. The treat was meeting fellow bloggers at the speaker program. Last year I met with Julie Thompson-Adolf - Growing Days and this year not only Julie but Daricia McKnight - A Charlotte Garden and Karin Hicks - Southern Meadows came to the Arbor Day presentation. Julie, Daricia and I have met before at the past two Flings but we hadn't met Karin in person before this past Friday. It was a lot of fun, such nice ladies! We talked about past and future Flings...Portland is next... can't wait; about blogging and the technical side of the blogs...like adding alt text to our photos; and of course we talked about plants. We also made plans to meet again soon. 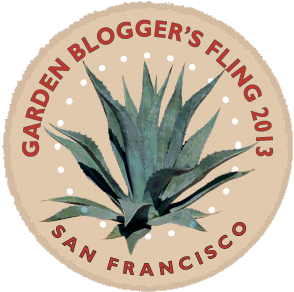 Our Garden Blogger Flings have been a lot of fun, seeing gardening- large and small, hearing representatives talk about new plants and of course getting to know bloggers from near and far. After the Asheville Fling many of us received some plants from Southern Living to trial in our gardens. You might remember my Mahonia eurybracteata 'Soft Caress' and it getting eaten by deer. Sad -- I really like the yellow blooms during the winter. Southern Living sent more plants this year. I received two more Mahonia eurybracteata 'Soft Caress', a Loropetalum 'Purple Pixie' and a Carex oshimensis 'Everillo'. All packaged -- arriving in great condition. Now where to plant my new goodies? Before planting, I kept them in my holding area. Loving that bold yellow foliage on the Carex. The yellow blooms on the Mahonia and the yellow foliage are super... quite the complement to the purple leaves of the Loropetalum. Before planting I sprayed my newbies with some Bobbex, a deer repellent. This one is supposed to be 'rainproof'. I will spray them again once the rain quits for a few days. Here is what those poor babies look like from last year--- still might come back, still crossing my fingers. They have been sprayed, marked with sticks, protected with some leaves or a log to keep dogs and people from walking on them. This one is a lot smaller...but I have faith that it will come back...as long as I have deer-proof spray on it. In a location up the hillside from the other Mahonia, the new ones are planted. The Carex is planted along the edge of the pathway through the garden. A nice bright bit of foliage in the shady garden. The Loropetalum needs more sunlight, so it is planted in the front garden...next to two other 'Purple Pixie' plants. The frost-bitten leaves have fallen off and those leaves/branches that were covered with leaves are fine. I have heaped more leaves over the remaining plants to continue protecting them from further cold weather. The Carex and Loropetalum survived the 20 degree temperatures just fine. Will check on the plants all through the winter and give updates. Earlier this fall I had the pleasure of participating in a podcast with John Markowski from An Obsessive Neurotic Gardener who interviewed me, Julie, and Mia - Modern Mia Gardening. If you have about 45 minutes, give it a listen. John has five podcasts done now and you can find them in the sidebar on his blog. He is a fun interviewer. If you like the podcasts, offer yourself as the next interviewee. As I said, garden blogging is a lot of fun and you meet some nice people. Where the heck did October go? I know, we are more than halfway through November, but boy, time sure has flown. Fall is a time I really enjoy being in the garden. Our lot is sloping downhill to the north which seems to accentuate the angle of the sun. As the autumnal equinox the sun's angle is sharply lower along the horizon. With these lower angles comes some great photo opportunities. Much of the time spent in the garden is waiting for that great shot. The fall blooming Cyclamen hederifolium is the perfect photo subject. These delicate pink beauties are such a treat this time of year. Some of the leaves are starting to emerge now, well after the first blooms. Many of you know we go to concerts.... a lot of concerts. I think that is where October went! We went to six concerts in October. The first of which was the Albino Skunk Music Festival, a great venue we have enjoyed a few times since we moved here. If you live in the North Carolina/ South Carolina area, you should think about going. This is a nice family oriented festival that occurs both spring and fall. Check out the link to see past performers. As I said we enjoyed SIX concerts in the month of October, it is feast or famine -- October was feast! It was a fabulous treat to see Willie Nelson at the Newberry Opera House, row G!! He puts on a great concert -- so glad we got to see him again! As with every garden in the fall, there are lots of changes going on. Mine has a lot of bird activity because of all the berries. I love having the birds around. Planting shrubs for food for the birds just makes sense to me. The variety of berries adds nice color to the garden as many blooms are fading. I added a couple more Ilex verticillata this spring- one male and one female, now there are two males and three female shrubs in the garden. The previously planted male was not looking very strong last year, so I figured another would be a good addition. Have lots of holly berries for the bird. The Callicarpa dichotoma 'Issai' is a Japanese Beautyberry and almost picked clean. It is the favorite of Mockingbirds, Eastern Towhees and lots of little birds that move so fast it is hard to make a good ID. The Wax myrtles, Myrica cerifera (or newly changed name- Morella cerifera) I planted a couple years ago are huge! These berries are about the size of a peppercorn. In Colonial times Bayberry candles were made from these berries by boiling the berries and skimming the wax off the surface of the water. Making one candle would take a lot of berries! In the same area as the Wax myrtles are my Viburnum tinus compacta 'Spring Bouquet', blooming and bearing berries. It has been a mixed up season. Love these blue berries. This is not something I planted, not even in my yard but the lot next door. I was looking at this tree, thinking it was a Black Gum, Nyssa sylvatica. I was pretty excited to see the drupes up in the tree, confirming my assessment! 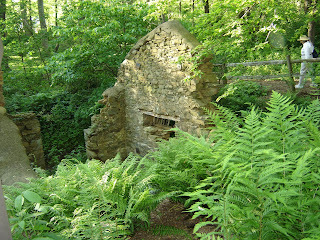 We have one along the edge of our property closer to the house but it is in bad shape. There is a lot of crown dieback, not sure what happened to it. Growing in multiple spots in the yard is Euonymus americana, or Heart's A Bustin'. These seed pods are like little jewels hanging on the end of a rather bare stem. You know it is from my yard as there is black dog hair on it! I have been saving the best for last-- Spicebush berries!! Lindera benzoin has berries! Let me say it again, I have berries!!! This shrub needs both a male and a female shrub to get berries. I bought two plants this past spring at our Native Plant sale. Now, I am aware that the flowers could have been pollinated before I bought them, but I have my fingers crossed for next year! There aren't too many berries, but I am happy with there are some! Besides seeing berries in the garden I have lots of little buddies rustling the leaves, making me think there is a huge animal coming through the woods into my realm. These Anole find the funniest places to pop up. I often see little bitty frogs and toads, but this it the first gray one that I have come across. This little guy is really small, he is sitting on the tip of a lobe of a red oak leaf. I love being on the water, these Great Blue Herons always look so regal as they walk through the water, looking for their dinner. Mid-October we went to a animal rescue release. There were three Great Horned Owls released in our area, it was quite magnificent to see these birds. Had to almost duck while taking pictures as they flew from their carriers. Other creatures were sighted this past month of the alien kind.... (wink wink) These were our Halloween costumes this year. I think next fall I will do a post on how to make them -- so if you are looking for an easy costume, stay tuned! Our early summer was pretty wet and in past posts I shared mushrooms that have appeared, well, we also have some ferns popping up. Identification of the ferns were not straightforward, samples have been sent to USC Herbarium for ID. Initial ID from their experts say it is a Cinnamon Fern, Osmunda cinnamomea. Will keep you posted when I get info back. I DO know what is growing in this little container-- Liatris spicata, I gathered some seeds and put them on the soil of the pot. I also scattered a bunch of the seeds from the flower stalks. Not knowing what the seedlings look like, I thought a control planting would be a good idea! So my friends, I will part with a shot of my previously beautiful Pineapple Sage, after the frost. I will get back to regularly reading and commenting on your posts. I will start with your most current posts and try to hit everyone. Sorry to have been away so long! This time of year the wildflowers that jump out at me are of course all the different Goldenrod varieties that are blooming now. There are about 60 species of Goldenrod, Solidago native to North America. Pair that gorgeous yellow with some of the purple blooms are are gracing us with their presence to complement the yellows. This is along the road as I go into town. A field of Solidago with Ironweed, Vernonia noveboracensis creating a dreamy mixture of golden yellows and bold purples. I stopped the car and walked over to the edge of this road to try and get a great photo as evening fell. I was worried that there wouldn't be enough light. For your viewing pleasure.... purple Vernonia and yellow Solidago growing wild along the roadside. This year I was able to buy some Vernonia noveboracensis at the native plant sale. Mine isn't quite this tall yet, we shall see over the next few years if it is happy where I planted it. This wonderful example in nature makes me smile, it is a happy happenstance. While mine are small, I will enjoy these big and bold natives. Another purple and yellow combination a little closer to home are some Liatris and Chamaecrista fasciculata or Partridge Pea. This is just outside our back gate of the neighborhood. Here is a closer view of the Partridge Pea, a favorite of the Cloudless Sulphur butterfly. The pollinators are happy with these bright yellow blooms. I am happy to say I have a number of varieties of Solidago in my yard. Thanks to Ellen, this is not a Solidago but a Chrysopsis mariana, Golden Aster. Thanks!!! Also appearing in my yard is Liatris, (happy dance!!) I bought some that are in the backyard gardens, they bloom in the late spring/early summer. These natives bloom in the fall. Hoping they reseed and spread in this rather hostile dry area by the street. I wanted to include a new little bloom. This sweet little flower's common name is Wart-removing Herb. Such a icky name for a cute little flower. It is Murdannia keisak. It is growing in a damp area in the turf. Doesn't this remind you of a Spiderwort? One of the links says it is similar to a miniature Spiderwort. I stumbled across another purple/yellow combo this afternoon while enjoying my woodland garden in the backyard. Blue Lobelia, Lobelia siphilitica and another Solidago. Wonderful!! Thanks to Gail at Clay and Limestone for hosting another Wildflower Wednesday. Stop by and see some of the other natives across the country and around the world. This past summer was wet, a lot wetter than previous summer since we moved to South Carolina. Besides the joy of not having to worry about watering plants, we enjoyed a bumper crop of mushrooms. They were varied, colorful and popped up in multiple places... everywhere except the logs that I had inoculated with mushroom spores after hearing Tradd Cotter from Mushroom Mountain give a talk to the Master Gardeners. I shared with you how I drilled the logs and plugged them here. These inedible ones popped up in the mulch in the backyard that had reddish caps. What does this one look like to you??? looks like the snails like mushrooms. This is the gnarliest one I found in the yard. Almost looks like a pinecone. Finally, a year after plugging the logs, I finally found an edible mushroom!! I was sure this was a Shiitake, up until it was time to eat it. I had to send a picture to Tradd for verification. Call me a scaredy cat..or cautious, but I wanted to be sure!!! This is the first one I had harvested --waiting for them to start popping. Looks like some"body" took a bite of my first mushroom! Do you grow mushrooms? How long did it take for you to harvest the first one? I also plugged some Oyster mushrooms, waiting on them to appear.